All the old stories and the new wild adventures are waiting for you to go and get it! Here is what I sent to Misty as we did this using old school paper and ink. The first rule of interview is we don’t talk about rules! I’d say try and and answer one question at a time, don’t read ahead, don’t think too hard. I thought it would be fun to go old school and give this to you in hardcopy, there is a certain aspect of artist that in me needs paper and pen. Do what works for you. Feel free to respond electronically or hardcopy or telephonically or in-personally which is not to say impersonally!This should be easy and fun, if a question isn’t, let me know and we’ll remove it from the interview. This is about you so share what you want. Thanks and wish you funfromAtoZ! First question – what are you drinking in this pretend game? Excellent Answer, see this is so easy! I read your bio on http://southerncomforters.org/2013featuredquilter.htm and I learned that you grew up surrounded by of creative women, who did all types of handwork. Growing up within a creative community is a great experience. Any lessons that you learned back in the day that are still vital to your art today? Use the best tools you can afford. Collaboration can be both fun and aggravating. It is important to share your creations plus your knowledge & skills with future generations. I don’t think you can throw out the baby with the bath water, so feel to talk “art” in general way don’t worry if it’s a quilt or a painting. You grew up in the south, studied art in Baton Rouge, a city filled with rich artistic influences. How has this experience influenced your art? Actually grew up in rural Northern LA, not much going on artistically. I watched a lot of Bob Ross. who encouraged me to pursue my passions, unlike others who didn’t “get” it. Let’s play a number guessing game, so you don’t need to look up the answers, guessing is totally fine… And you are welcome to tell any stories you want along the way, this is all about you! 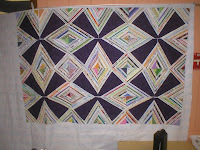 I understand that you, like many other quilters, first caught the quilting bug when you had a baby. 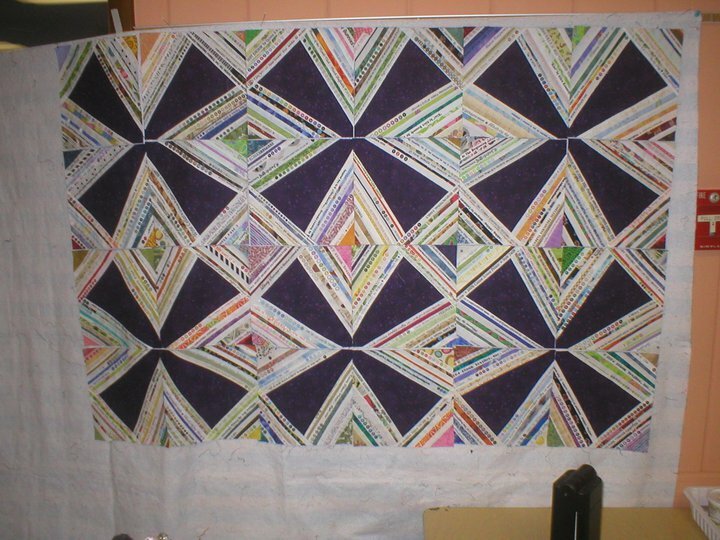 So starting with that first quilt, how many quilts have you made? 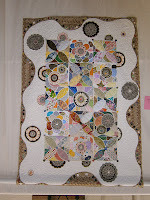 Ok, the quilt police show up at your door, how many quilts would the quilt police say are traditional vs art quilt? I am the type to write down an idea on a dinner napkin, a receipt, any paper, my hand, etc. Number of scissors you own? 6ish just for sewing. I’m a get rid of the old when I replace it gal. Favorite size machine sewing needle? Personally, I love that you have made traditional quilts that have a very current flair. Your Shades of Baltimore in another colorway, wouldn’t have the zing. Now I get to use one of my favorite words… Juxtaposition! 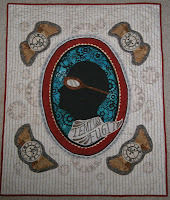 Tell me about the creative process for that quilt, did you think of the juxtaposition of the very traditional Baltimore Applique with the black background and candy color that are right out of the Easter basket? Sorry, leading the witness! 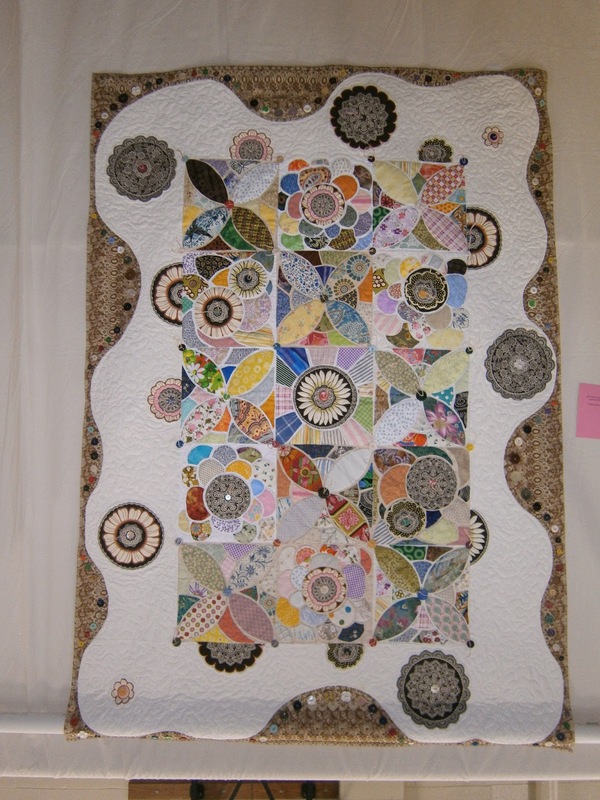 Jury, please disregard that last question… I’ll rephrase, tell me about your creative design process for this quilt. Pattern? Inspirations? Thoughts? I think this is funny because I DID NOT DESIGN THIS – totally a kit that I bought, all the hand dyed came with it, I wanted to try applique and saw that in a magazine and thought I’d try it out. But the photo caught my eye – the traditional design with those brights contrasting on black. 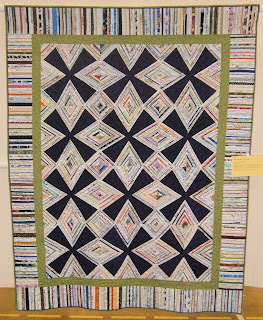 Do you know which of your quilts is one of my favorite? 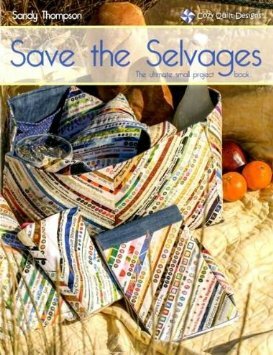 One is Orange Lotus – I’m obsessed with circles, so that’s one reason, but it has that prettiness and grace that hand applique offers; and a unique curved border that is very organic, a spilled milk on the counter kinda way. And you know I love Crab Cakes! It’s got undeniable whimsy and humor. 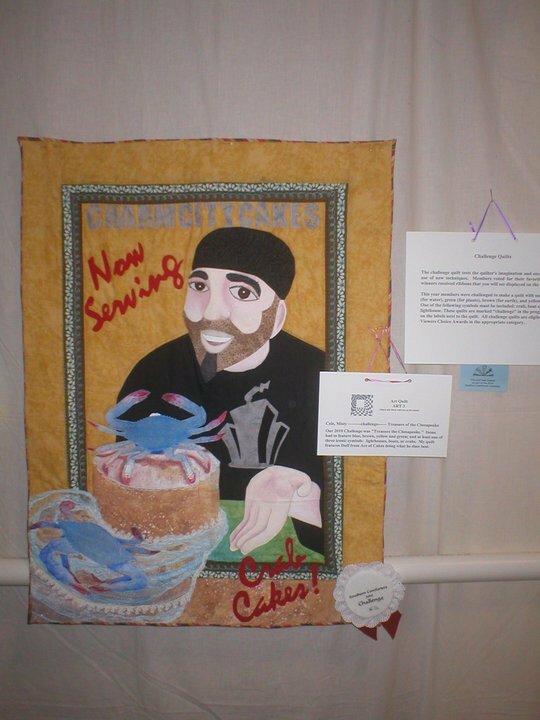 You captured the essence of Ace of Cakes and created a piece with real Maryland flavor, incorporating both sewing and painting techniques. If you got it, flaunt it! 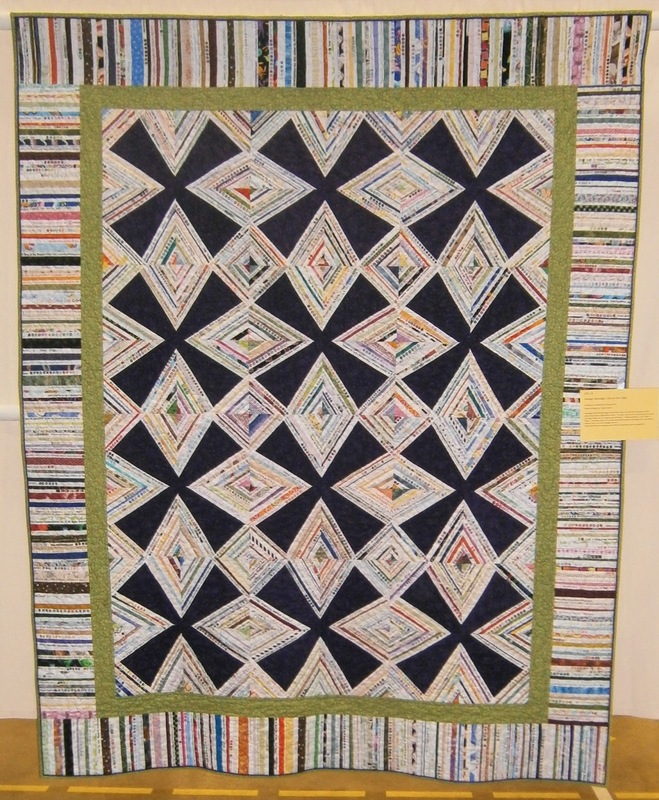 Here’s my tough question – which 2 quilts do you consider your favorites and why? I love Orange Lotus, too. I enjoyed every step of making that quilt. I’m glad I gave myself permission to machine quilt it. I loved sifting through the button box. I like the one called Coral Snake – it was a round robin with a friend, Alicia Simon. We work very differently, I learned a lot. Plus it looks great in my living room. The fabric was a gift from my sis from Cambodia and I love it. 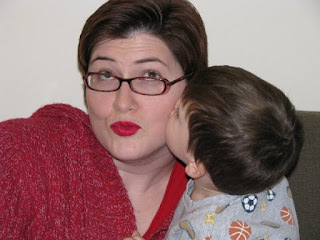 You are a mom, wife, teacher, artist and have many other roles in life. I see a happy, balanced spirit in you, what words of wisdom do you have for other regarding balance? If you don’t love it, let it go. Don’t apologize for doing what you need to do – others understand and respect it. My kids will remember my passion for my work- I let them see me struggle, fail and try again. Next we enter the speed portion of the interview – pick one word from each of the 13 pairs below. Studio audience - I have secretly put 13 pairs in here, because 13 is Misty’s favorite number. And now, the question every quilter, traditional or art is wondering – do you sew with your shoes on or off? Or do you kick off the right shoe? I’m barefoot whenever possible, must be my redneck roots showing. Oh, yes, I forgot to mention, I have a time machine and you can send a message back to your younger self - what advice would you give yourself about adventures in art? Make art for yourself. You don’t have to show anyone if you don’t want to. And that art teacher in college that made you second guess yourself was an idiot. Thanks for playing along with me! Is there anything else about your art or your artistic journey you would like to add? I still feel like a beginner in many ways, even though I’ve been making art since I could hold a pencil. My art at age 10 looks like my art nearing age 40. For me making art is not optional, it is something I do like breathing or taking a walk. 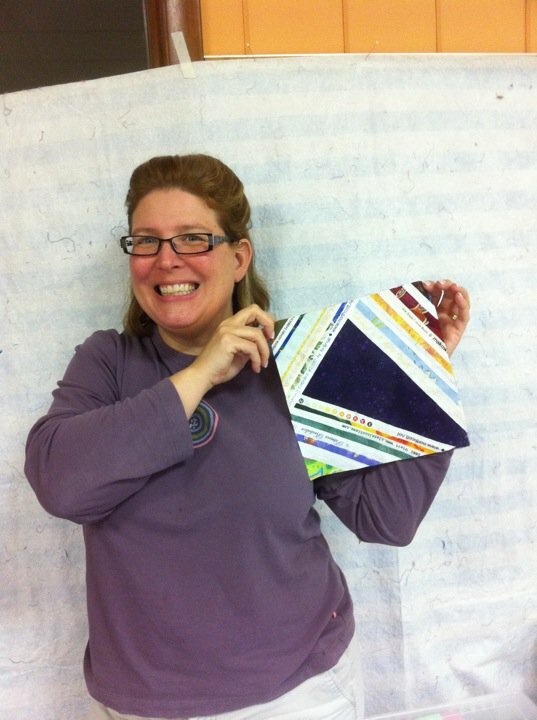 Visit Misty next week, at the Southern Comforter's Quilt Show as the Featured Quilter!